Do You Do These 14 Things All Great Salespeople Do? Below are 14 things great salespeople do that average salespeople only think about. If you want the broader explanation of each, check out my free eBook on the topic! 2. Don’t settle for average. 3. Know their job is to help those around them succeed. 4. Understand what service is all about. 5. Like to hear the word “no” from a customer. 6. Value time and never end a day without knowing what they’re going to accomplish the next day. 7. Are optimists not just while they’re on the job but also in everything they do. 8. Know they have to be continually evolving their sales process. 10. Don’t stop at the end of the day. 11. Live by a code of ethics and standards, not just when things are going well, but more importantly, when things aren’t going well. 12. Are proud of what they do. 13. Don’t rely upon a canned presentation. 14. Know success is not what they did yesterday, but success is what they will do today. 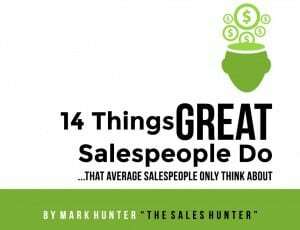 Remember — you can get more insights from my ebook 14 Things Great Salespeople Do that Average Salespeople Only Think About! Download it out today! PrevPreviousAre Your Questions Relevant to the Customer? Think S.T.O.P.